Dates of birth and death unknown. His first recorded performance was in the 11th lunar month of 1722, when he performed in Ôsaka at Ôsaka Kuzaemon's theater as a katakiyaku in the kaomise drama "Tenchi Tennô Sokutai Guruma", which was produced by Arashi Kanshirô I. He played in the same theater in the 1st lunar month of 1723 the role of Kiso Yoshinaka in the new year ni-no-kawari drama "Keisei Tomoe Daiko". He appeared on stage for the last time in the 2nd lunar month of 1726, in Ôsaka at the Naka no Shibai, where he played the role of Takashima Yasozaemon in the drama "Butsumo Mayasan Kaichô", which was produced by Yamamoto Kyôshirô I. 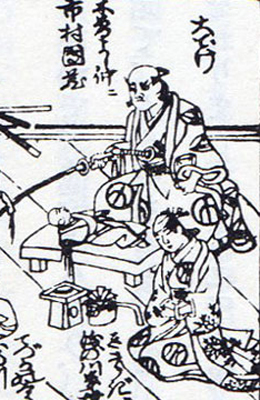 His ranking in the 1726 Ôsaka hyôbanki, katakiyaku section, was jô (superior) [visual]. No record afterwards. Dates of birth and death unknown. 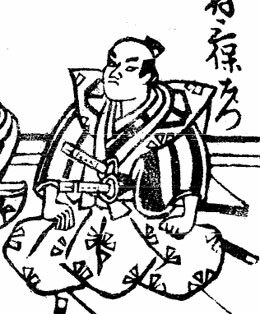 First record in the 11th lunar month of 1734, when he performed under the stage name of Hamazaki Rokujûrô as a katakiyaku in Kyôto at Miyako Mandayû's theater in the kaomise drama "Tomi Yakata Kogane no Yaguruma". He took the name of Ichimura Danshirô in the 11th lunar month of 1737 in Kyôto at Ebisuya Kichirôbê's theater, performing in the kaomise drama "Hachiman Tarô Denju no Tsuzumi" which celebrated the shûmei of Yoshizawa Sakinosuke II. He went to Ôsaka in Fall 1738 and took the name of Ichimura Mihoemon in the 11th lunar month of 1738 at the Naka no Shibai, performing in the kaomise drama "Fuji Daiko Wagô no Shirabe" which was produced by Arashi Sangorô I. He played in the 12th lunar month of 1748 at the Kado no Shibai the role of Kô no Moronô in the play "Kanadehon Chûshingura", which was adapted for Kabuki for the first time [casting]. His rank in the 1749 Ôsaka hyôbanki, katakiyaku section, was one black stroke below jô-jô (superior - superior) [visual]. He played in the 7th lunar month of 1749 in the same theater the roles of Ki no Aritsune and Tokuemon in the drama "Osana Narihira Izutsu no Kagami". No record afterwards.